"e;Romanticism - and Byron"e; is a book in two parts. In the first part, Dr Cochran examines "e;Romanticism"e; and shows that it is a word meaning anything, and therefore nothing. It is an academic construct created by academics, and has no basis in the writings of the early nineteenth century. Its continued use, argues Dr Cochran, is a modern marketing phenomenon solely. 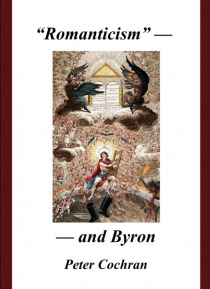 In the se… cond part, Dr Cochran examines the life and work of Byron in the non-"e;romantic"e; context of his contemporaries. He shows how Byron's antithetical nature created problems when he was forced into compromising situations with friends who were close to parts of his mind, yet irreconcilable with one another. This "e;mobility"e;, argues Cochran, was often an embarrassment for Byron's social life, but of great benefit to his creativity. This part of the book features chapters on Shelley, Scott, Blake, Keats, Coleridge and Wordsworth, and is notable for the amount of original archive documentation with which Cochran illustrates his theme.